So, Trumpcare failed. I was expecting there to be a Twitter overload around 3 AM, and there wasn't... Cynical me says they new the ultimate outcome on Thursday and delayed the actual announcement until Friday to keep the stock market from going into a death spiral. And the reason there was no Twitter Storm? The Idiot in the White House did what he's always done in the face of losing battle: he walked away. That's right, in his mind he filed it under legislative bankruptcy and it has joined the other bankruptcies of his past, in a dirty closet. And the Anti-Heroes of the hour were not some fine, upstanding congressmen who realized what a disaster this legislation was, rather a group of self-centered, ultra conservatives were the ones who gave the Idiot a one finger salute. You see the legislation, as it stood, didn't go far enough. People... human beings with pre-existing conditions were still going to be covered, and prenatal care, among other things. These conservatives hate that their tax money is going to be spent for these things. 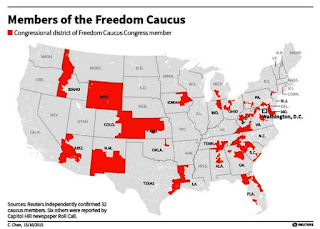 You see, the American Freedom Caucus is really, really greedy. If you think Golum had a thing for the Ring, you should try and get between members of the American Freedom Caucus and their money. In fact, this group has become the Achilles tendon of the the GOP, they will hobble every piece of legislation that doesn't kiss their greedy, social conservative asses. That's right, these are the people who totally hate Planned Parenthood among a litany of other things. They are uncontrollable. And if the Idiot in the White House wants to push any legislation through Congress, he's going to need to bend to their will... or else get remove them from power. In fact, if the GOP had any intelligence (which doesn't seem likely) they should have already started working with possible candidates who are less... strident in their political beliefs. Of course we know that ain't going to ever happen. The Republicans are too desperate for their votes in order to stay in power. So, for right now, the American Freedom Caucus members are Anti-heroes. Isn't it nice to know that they might actually be good for something? I'm still smiling at his failure. And I'm smiling because he's saying now that he never wanted to push healthcare through. That man is shameless. looks like there is one of these idiots in lancaster county PA.